SELL DIAMONDS NYC Area. We Buy Diamonds In Any Condition. Diamond District New York – D&G Buyers, Inc. Honest Jewelry Buyers Inc. Buy And Sell Jewelry New York. Here’s Why We Buy Jewelry New York. Wondering Where To Sell Antique Jewelry in NYC? Looking to Sell Gold Coins in NYC? Looking To Sell Diamonds in NYC? D&G Buyers, Inc. is the best place to sell watches NY! Looking to sell gold NY? Then look no further! We buy diamonds in New York, and have been offering cash for diamonds for many years. D&G Buyers Inc, situated in the diamonds district New York is the perfect place to sell diamonds NYC! Over the many years that we have been open for business down here in the busy New York diamond district, we have had the pleasure of serving literally thousands of customers. It does not matter to us what form or state your old diamonds are in, they are all still valuable and worth something to us here at D&G Buyers, Inc.
You might also be surprised at just how many items in your dusty old jewelry boxes contain diamonds. All of these diamonds are highly valuable, as demand in the diamond industry continues to reach ever loftier heights. This is great news for you guys of course, as it means that now is an ideal time to sell your unwanted and unused diamond items, and exchange them for some much wanted cash. Whether you need the cash to help out with your bills, or just fancy a nice bit of spending money for you holidays this year, D&G Buyers, Inc. can make that happen for you! Where exactly is the diamonds district New York? Well, that is a great question. And it is one we should probably answer for you if you are considering coming down and taking advantage of our fantastic cash for diamonds arrangement. Well, the short answer is that the diamond district is located on West 47th Street. You will find it in between 5th avenue and 6th avenue. All you need to do is take a quick wonder around the world famous diamonds district New York, and you will soon begin to see how the area got its name. It is an area which is renowned the world over for it’s extremely high concentration of diamond dealer shops, and every day thousands of dollars worth of diamonds are traded in this small area of midtown Manhattan. Remember as well, that anyone who is coming along to our store to take us up on our free appraisals offer can also take advantage of our great free customer parking. This hugely popular area of the city is exactly why we buy diamonds in New York rather than anywhere else in the country. We just love how busy and competitive it really is for all of us diamond buyers and sellers down here in NY, and we just could not have it any other way. So come on down and see what all the fuss is about. 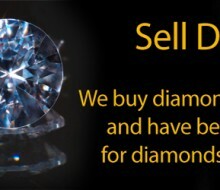 Bring your old diamonds and bits of diamond encrusted jewelry along with you for a free, no strings attached valuation. You could even call ahead beforehand and have a chat with one of our friendly and professional team. Simply call 800-965- 0980.